How will you contact me when the delivery is arranged? Why should I use the "I AM ONLINE" function? What if I do not receive the full quantity I ordered? How do you protect my game account information? How to sell your player in the Auction House? 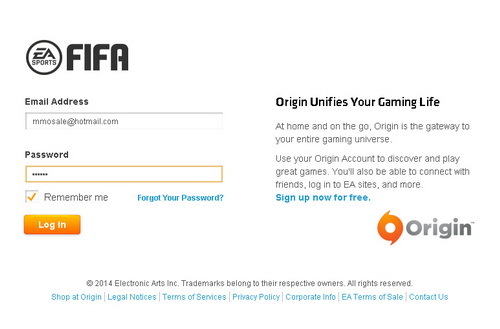 How to find Origin Backup code? It depends on which game you are purchasing and which delivery method you choose. We always use the corresponding method for delivery. If you select "Face-to-Face In-game trade," we will notify you to enter the game by MSN, SMS, phone call, or other means. Note: The "I AM ONLINE" function does not require you to stay at the computer or wait on our website all the time. As long as you are at the computer, just make the button as "I AM ONLINE" and minimize the browser. Once we are ready to make the delivery, we will ask you to enter the game through your other reserved contact information. If you cannot be online for a couple of days or longer, your order may be delayed. In some cases, we may fill an order by making the delivery in several stages. Therefore, you do not have to worry about it. We will make another delivery again as soon as possible. Our delivery system involves logging in to the customer's game account and leaving the gold on their character. Using this method, we have successfully delivered over 6,000 orders without any incident. We have put in place several safety measures to protect your account information. 1. Our site's database utilizes multiple encryption techniques. We have adopted the most advanced MD5 encryption methods. No one can gain access to your account information even if our website is attacked by hackers. 2. Our site control panel management system requires authentification. Every computer in our office has unique hardware for identification. Only the computers with such hardware installed can enter our site control panel management system. This is the same technique used in online banking. 3. In our site control panel management system, your password is held in part by two chief administrators. Neither of them can get your whole password. We utilize our encrypted logger (log in software), and then each of the two chief administrators types in the part of the password in his or her possession. 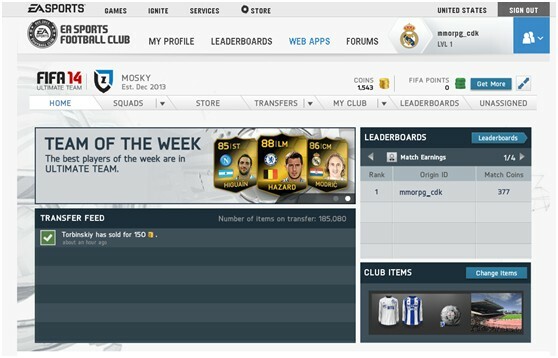 This is a tutorial of teaching how to sell your FIFA 14 Ultimate Team player in the Auction House, can be applied to these editions: PC, PS3, PS4, Xbox 360 and Xbox One. 2. Answer the security question after successfully logged in. 3. 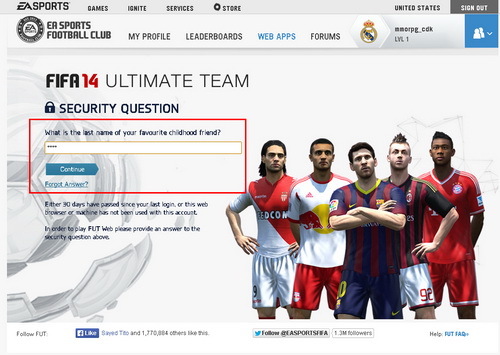 Correctly answer the question, and then you will be directed to the FIFA 14 home page. 4. 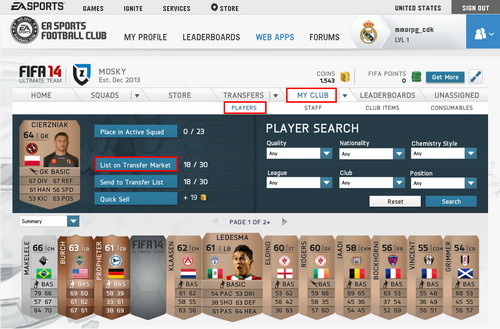 Click “MY CLUB”, and choose “PLAYERS” to open your players’ list. Choose an unneeded player, and click “List on Trabsfer Market” to sell this player. Note: If the “Quick Sell” panel shows “+0”, it means that this player is not available for auction. If you don’t have an extra unneeded player to sell, you may buy one randomly from the Auction House at cheap price, with only several hundreds of coins. 5. 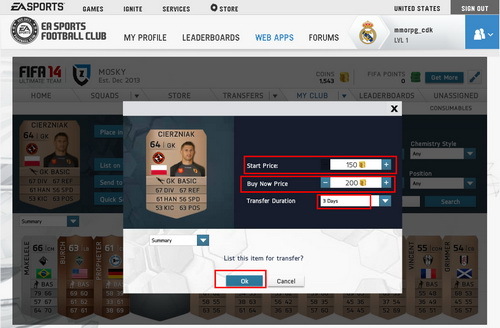 Click “List on Transfer Market” to set the player’s price. 1) Start Price must be lower than Buy Now Price. 2) Set Transfer Duration as 3 Days. 3) Set the Buy Now Price as 105% of the amount of coins you ordered from us. 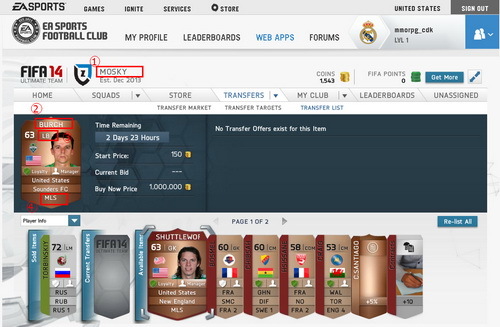 E.g., if you ordered 100 coins, the Buy Now Price of your player should be 105. Then click “OK” to finish. 6. 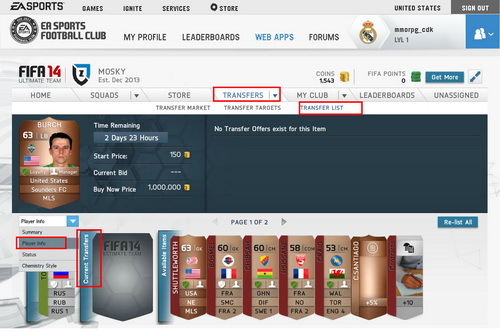 Now you may click “TRANSFERS” and choose “TRANSFER LIST” to check the file of the player that you’re selling. Note: Click “PLAY INFO” to see the player’s league. This is a tutorial of teaching how to transfer your FIFA 15 Ultimate Team coins, can be applied to these editions: PC, PS3, PS4, Xbox 360 and Xbox One. This is a tutorial of teaching how to find the Origin Backup code, can be applied to all FIFA games.